This is the Heuer Montreal 110.503 in its rarest and most sought-after execution. 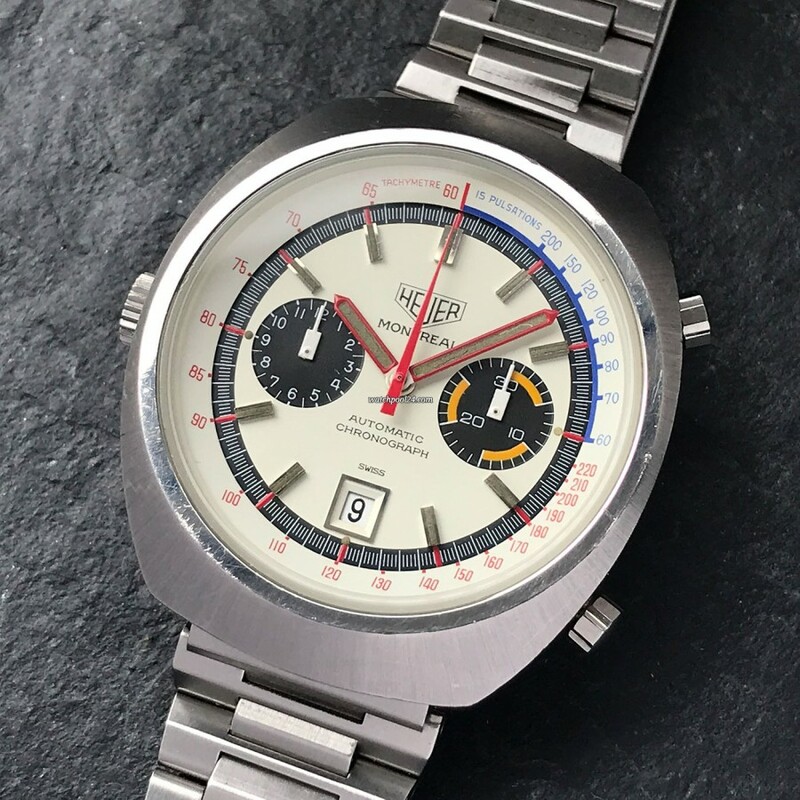 Heuer introduced this new racing chronograph in 1972 and named it after the city of Montreal in Canada, which was the venue of the Summer Olympic Games and Formula 1. Visually the new Montreal differed significantly from all other Vintage Heuer models. The first series of the Heuer Montreal was available with different dial designs. Here we offer you the rarest and most sought-after execution with a white dial and a plenty of colors on it. This wristwatch is a proud representative of the "colorful" 1970s era. The dial features a tachymeter and a pulsometer scale. Another special feature of the Montreal is the large pillow-shaped case. The Montreal offered here is in excellent overall condition. The case was never polished. The top surface still has the original brushed finish. The vintage dial is absolutely perfect. The white surface has a slightly creamy patina, giving this watch a charming vintage character. A beautiful and original vintage stainless steel bracelet accompanies this Montreal. The Heuer-signed clasp is expandable. This Montreal is driven by the automatic Heuer Calibre 12 from Heuer. The movement was checked by us and runs flawlessly. The chronograph starts, stops and resets properly. The first execution of the Montreal was only produced for 4 years and is thus an extremely rare wristwatch. Based on our many years of experience, we know how hard it is to get a well preserved example of the Vintage Heuer Montreal. That's why we are very happy to be able to offer you this specimen in excellent condition here on watchpool. Another interesting fact: the Heuer Montreal is one of the few vintage Heuer models which was not reissued yet. That's one of the reasons we see this striking Heuer model as an insider tip for watch collectors.